SETTLE INTO A SIGNATURE BASIC WITH THE RVCA HAPPY PLACE TANK. 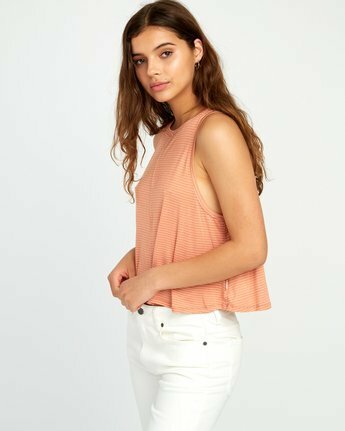 SOFT AND WASHED-DOWN, THE RELAXED JERSEY TANK TOP TAKES AN EASY-GOING APPROACH TO YOUR ESSENTIALS, ADDING A MODERN HIGH NECKLINE AND DROPPED ARM HOLES FOR A SNEAK SIDE VIEW. ULTRA SOFT, THE SOLID TANK TOP IS FURTHER CUSTOMIZED WITH A CENTER FRONT SEAM DETAIL.